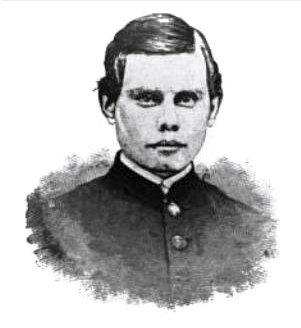 Benjamin enlisted as a private in Company C, 5th Rhode Island Heavy Artillery, on 4 November 1861. He was promoted to corporal on 7 June 1862. 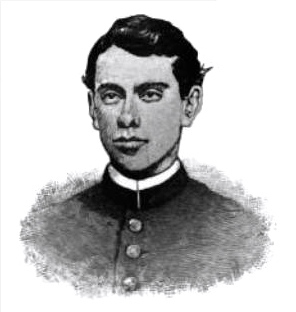 He was wounded in the right shoulder at the Battle of Whitehall, North Carolina, on 16 December 1862, and promoted to second lieutenant on 22 April 1864. He was mustered out of the service on 23 December 1864. Benjamin mentions his brother, Joshua C. Drown, Jr. (1845-18xx), who enlisted about six weeks after Benjamin in the same company. He was promoted to corporal on 7 June 1862, at the same time as his brother, and was promoted to sergeant-major on 18 July 1863. 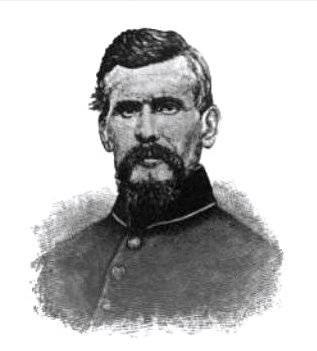 He was also promoted to second lieutenant in December 1864 but decided to decline the commission and return home. 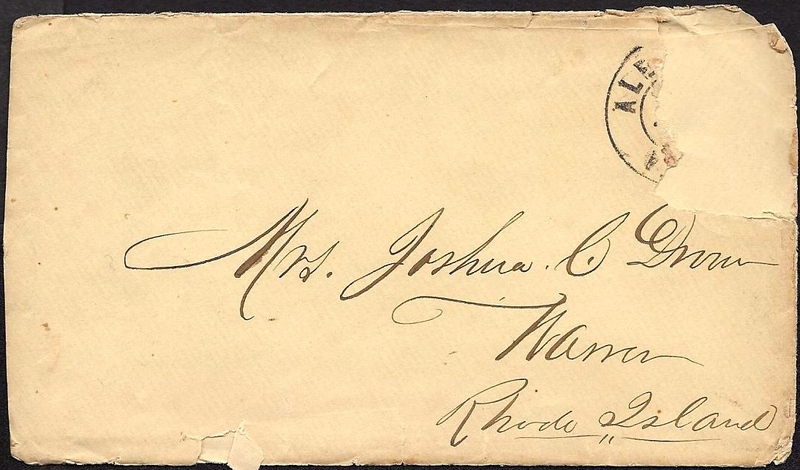 As we learn in the last letter, Benjamin’s father, Joshua C. Drown, Sr., decided to enlist in August 1862. He served in Company A of the 5th Rhode Island Heavy Artillery until receiving a disability certificate in July 1863. 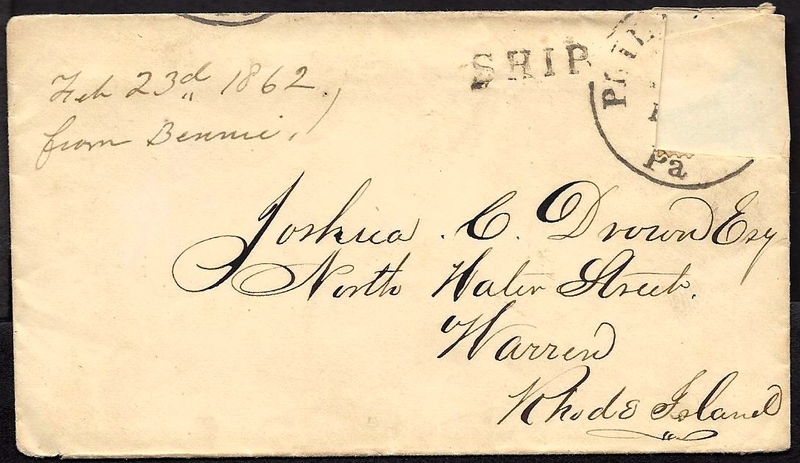 I have nothing else to do this afternoon so I will try and write a few lines to you.I sent you a letter about a week ago just after the battle [The Battle of New Bern] which I hope you have got by this time. And last Sunday I wrote some six letters home — one to the most of the folks, and also one to Annie Walter. 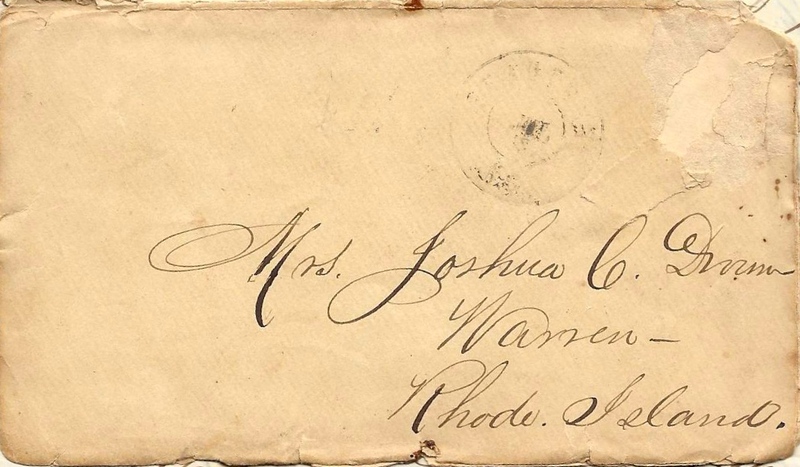 [My brother] Josh and myself sent 12 in all and in Aunt Mary’s letter I sent the list of articles that I wanted you to send in our box which I [am] waiting anxiously to see. It is Sabbath day and more, we had services today and were very fine. It is cloudy today the most of the time it is so for winter is just broken up. We are well with the exception of some cold that we have got for we have been exposed to all kinds of weather since we landed. But we have had pain killer and molasses now for one or two nights and have got some lemons that we are going to make some hot lemonade that I think will do us good. But it is nothing serious. You need not worry. I will give you our orders on the Island. We have to turn out at 6½ o’clock A.M. for roll call arms and equipments all on and those absent reported to the Gen’l of our brigade. Breakfast 7 o’clock, sick call 7½ o’clock, guard mounting 8 o’clock, drill 9 o’clock. Recall 11 o’clock, dinner 12½ clock. On drill call 2 o’clock P.M. Recall 3¼ o’clock, Dress Parade 4 o’clock, supper 5 o’clock. Tatter 8½ P.M. Apps 9 o’clock at which time we are all glad to crawl into our tents and drop to sleep by some unknown time by the frog which makes me think of home in summertime. One thing I think is very strange — that is there’s hardly a night passed since I have been away but what I have dreamt of home and seeing some of you. This encourages me a good deal. We are expecting a mail hourly. At any rate, I hope so for I am most crazy for one and expect a fist full of letters and papers. 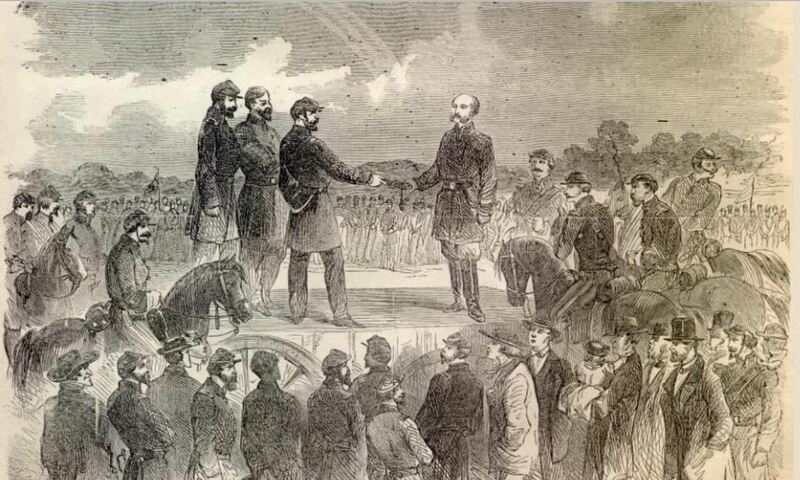 We have had a report that Gen. [John Buchanan] Floyd has been taken in Kentucky with 1500 prisoners. If this is true, it is glorious for he is a rascal. He deserves stringing up, I think. I want some handkerchiefs for one thing to come in the box for I don’t know as I mentioned them. In the letter that I sent Aunt Mary was Josh’s certificate for his money and want you to let me know if you got it in your letters. Yesterday was Washington’s Birthday. There was 34 guns fired from the fort close by our camp. If they had been in Warren, I think it would [have] taken out some of the windows. We are to be paid next week, I expect, and shall send my money in the next letter, I think. Let me know if you got all my last pay. I must close soon for it is most time for dress parade and I have got to brush up and make myself as slick as possible. We have a prayer every night at parade. I would give a good deal if you could have some pictures of us since we have been on the Island. They would look interesting to you, I think. Well, I think I will bring it to a close soon. One thing I wish you would say to Grandpa if he had such land at home as there is where our camp is, he would not have any weeds or stones to pull for it is sandy soil here where it is dry and clear. Over back of the Island there is hills of clear sand some fifty feet high and it is a beautiful sight to get on top and take a view all over the [Albemarle] Sound. Josh is side of me trying to rest a little. He sends his love to you and sisters and a kiss to Ruthie and his love to the downstairs folks and all. Walter is not here but he always tells me to send his best respects to all of the folks. I will close with my love to you and the girls and lots of kisses to my little darling Ruthie. Give my love to all the folks. Give it to Grandma, Grandpa, James, Mary, Josh and all. I am looking anxiously for my box. I will close asking an interest in your prayers. ¹ The regimental history states that this expedition was composed of the 5th Regiment Rhode Island and a detachment from the fleet, under the joint command of Major Wright and Captain Jeffers of the navy. 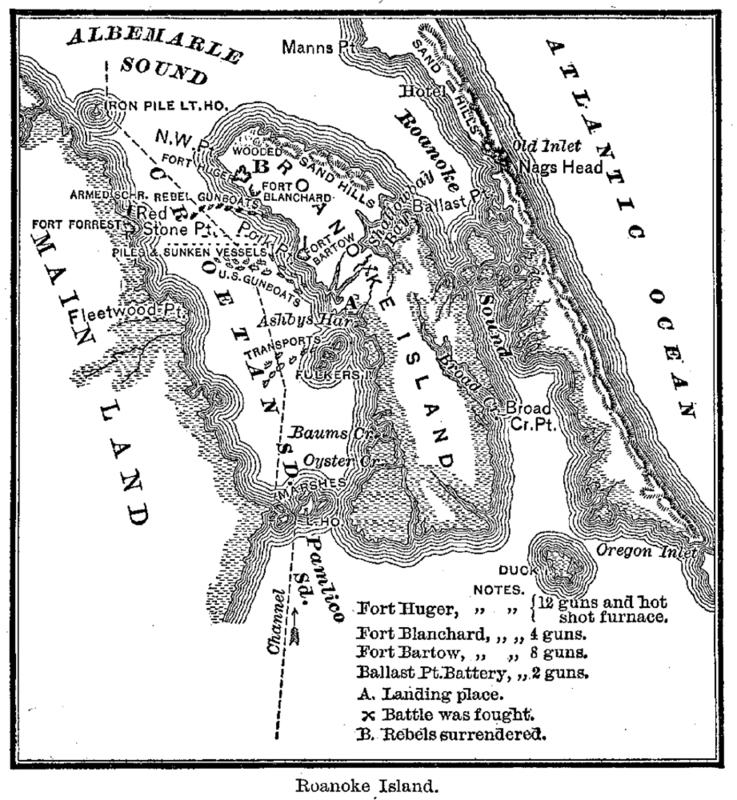 The expedition commenced on 19 February 1862 and went by the stern wheeler Union up the Currituck Sound to destroy “some salt works about sixty miles from Roanoke Island.” They were stopped in the “Narrows” by shallow watering barely made it back into the deeper waters of the sound before nightfall. On the return trip, they captured the small schooner used by rebels to escape from Nag’s Head on the day of the battle of Roanoke. You must excuse me for not writing to you sooner for I have not had any time since we left Roanoke and since the Battle at New Bern, we have been moving most of the time. We have been here a week yesterday and this is the first day I have had a chance to write — the first day that I have been off duty all day. I received your postage stamps and was very glad to get them. Are very much obliged to you for them. I suppose you have got all the particulars of the Battle before this time. We are waiting anxiously for the paper to come with the particulars in it. I have sent him a New Bern program [paper?] to Father and shall send more as soon as I get them. I shall finish this letter in Lieut. [John E.] Snow & [George G.] Hopkins’ quarters. He has just been down to see if I would come up and stay there while he went away a little while. We like our two Lieutenants very much. We shared some of our cake and preserves with them. You cannot imagine how glad we were to get my box. I would like for you to have a picture of us when we were opening it and overhauling the contents. We have had some excellent suppers and dinners since the arrival. Those cakes were all splendid and tell Mother & Father their shirts are just the thing [and[ that we are extremely obliged to them all. Hope I can pay them all for their kindness. When Walter got his box, he left in our mess for me to take care of for he had such a class of men in his mess that he dare not leave it there for fear all things being stolen, so we — Josh, Walter, myself set our table together — the table consisting of a cracker box turned bottom side up. We sit down and eat with appetite more so thinking the things were cooked at home. This morning we had an addition. One of the boys gave us a sweet potato apiece and I boiled them and made out a fine breakfast. Oh we shall live splendid while it lasts. Tell Aunt Mary that I wrote. Josh was sick at the time. He had two days and nights sleep and now he is first rate. [He is] on guard today — smart as a cricket. In one of Aunt Mary’s letters you spoke about our being careful how we eat any provisions that we found in the Rebel’s camp. We don’t think about that Grandma, for when we get into the quarters, we are generally hungry enough to eat poison or anything else. Grandma, you need not feel worried about that for we don’t give them time to do that. The day after the Battle at New Bern, as we passed their camp, the kettles was in the fires where they had been getting breakfast and even dough all mixed, ready to bake left on boards. They had as much as they wanted to do to get away themselves. I shall send one to Mary Eliza in this letter. I will close. Give my love to Grandpa and reserve a part for yourself. Remember me all in your prayers. Goodbye. Beaufort Harbor of Fort Macon, N. C.
It is Sabbath morning. It is a cold, windy, rainy morning and I feel quite lonesome for I am away from all the boys on board the schooner and I can’t help thinking of home such mornings as these. I always think of home more so than if it were pleasant for when it is pleasant weather I have something to do generally. And I intended to go over to the regiment and spend the afternoon with my old mess today but as it rains, I can’t get there. So I shall be lonesome all day I expect. I received the stamps that you sent by Aunt Marg’s letter and am very much obliged for them for when I have stamps to put on letters, there is no danger of your getting them. I hardly know what to write you for I have no news to tell. We are all well and are getting along as well as could be expected. Since I wrote home last I have been promoted. I am corporal now as well as clerk. Grandma, I suppose you would be surprised to see [me] come home with bars on my shoulders. And I think I would to but such things has happened. I dreamt we all got home last night. Thought we had got our discharge and we had a glorious meeting. But I got back again before morning and the first thing I knew I was called to breakfast. I think it is rather strange but scarcely a night passes but what I dream of home and what a pleasant meeting we always get. But Grandma, I hope the time will soon come when it will be a true meeting, and I know when it does come it will be a happy meeting and a meeting which I hope and trust in God will never again be broken by the cry of war, war, war. I hope and I think that this Rebellion is near at a close for I think they can’t hold out a great while longer. I heard yesterday that 7 of the North Carolina Regiments had laid down their arms and gone home. They have elected a Union governor and was elected by a strong union majority. I heard that Burnside was at Raleigh. He told them that he wanted the state to come into the Union. And they wanted 12 days to consider, but the General told them he should do no such thing. They had either got to come back or he should whip them back; they could do just as they liked. That is the way to talk to them. Let them know we are not to be trifled with. I will close now and finish this afternoon for I want to have something to take up my mind this afternoon. 9 o’clock morning. Sunday afternoon, 1½ o’clock. I will commence again. It is still cold and blows and I am quite lonesome. How I should like to be at home this afternoon a little while just to see the folks. Grandma, when Sunday morning comes, it brings to mind the times I was at home. I used to sit there and have such good times with Jim and the rest of you. I always think of it when Sunday comes. Joshy and Walt are well and are getting along nicely. The last time I was over there, it was a very hot day and they lay in the tent trying to keep cool. When I went in, Walter was not there but before long he came bounding in barefooted and bareheaded and in his shirt sleeves. Tell Jim he is the same old chip as he was when he left home. The most that troubles him is shortness of tobacco just at the present season of the year. I expect he wishes he could come across Jim once in a while. He would make his tobacco suffer. I have not got so I can like it. Instead of liking it, I grow sick of it everyday. I hope we shall be at home soon. Give my love to Grandpa and tell him I hope I shall be at home in time to help him dry his potatoes. Tell him before I left Slocum Creek. Corn was up some three inches, and on some of the plantations potatoes was nearly large enough to dig and the trees was in full bloom and things looked quite pleasant. The captain has got some relation at Morehead City and they have quite a number of bunches off to the schooner consisting of roses &c.
Well do I recollect the last time I saw you all and when we left we thought we should be down again in a fortnight. But I think Grandma, it will be a long one. I hope we shall be at home, if God sees fit to spare our lives, so we can have a merry Christmas again next winter, for I never shall forget the last one I spent at home, for it was a merry one. I shall have to close now for I see I have written the sheet full. Give my best to Grandpa, Mary Jolls and James, and tell him I should like a letter from him. Love to all the rest of the folks. Good bye. P. S. Give my love to Aunt Mary Drown and Uncle Ben. Tell them I am alive and kicking yet. I received your kind and affectionate letter this afternoon and will now hasten to reply. Your letter that I received was dated the 4th of June. I was perfectly delighted to receive such a long letter from you for I must always write long letters and I like to get them in return. I am well and enjoying myself. 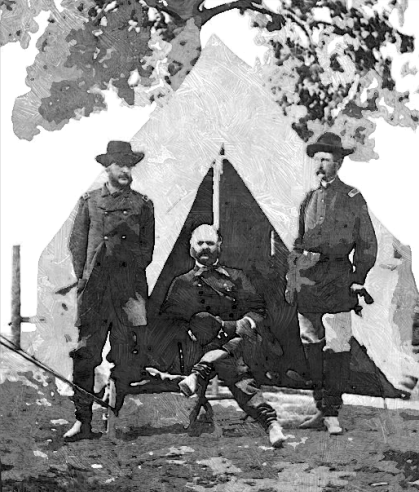 I was over to the camp Friday night and stopped all night with Walter and John and had a splendid time. I see in your letter that Uncle Dan had arrived in Bristol. I was glad to learn that he had got home once more for I think he must have got tired of Secession the position he was placed in. Give my best respects to him and tell him I am out here well and growing fat. I hardly know what to write you but I must always fill up the sheet though. As I see by your letter when you commenced you said you hardly knew what to write to fill up the sheet but I think you did make out to fill up number of them. I shall close this now for it is 8 o’clock and I am going to write of my journal and go to bed. Good night. I will commence again. When I left off writing the first sheet I intended to finish the next day but I went over to breakfast and there was an express just come in for the 4th and 5th Rhode Island on board a schooner from Providence — also a cargo of ice — but I did not know whether mine was amongst them or not. And when I went up to Capt. King’s quarters, he told me there was a box down to the Post Office for me and I went down to get it. But the Expressman was going to Newbern and I could not get it until he came back, so I waited patiently Thursday, Friday, Saturday, and last night I went over after it thinking of course I should get it when to my disappointment it had not been there — no such name in the “List D.” I think Capt. King must [have] been mistaken in the name. I was quite disappointed for I dreamt one night that I got it and had a nice time opening it. I thought I clapped the boots on the first thing. Last week I made out my pay rolls for my extra pay for April and May. It amounted to Twenty dollars and 40¢. I did not take it then. I am going to wait until the first of July and then receive 30 dollars and some cents. Capt. King told me he would pay me if I wanted it. I told him I would wait and take it all up to the first of July. I think this is better than $12 a month at home as long as I enjoy such good health, don’t you? You wanted to know who Capt. King was. All I can tell you is he is Capt. King — he belongs in Illinois. He has a brother with him — a very fine young man. You wanted to know how I did my washing. I was washing the day I received your letter. I whittled out a rubbing board the other day with my jack knife, but I found a place in Beaufort the other day where they wash and do them for 5¢ a piece. So I think hereafter I shall send them there. I shall send most of my extra pay home when I receive it. The Schooner William Magyk sailed from here over a week ago so I suppose before this you have received my box I sent. Please let me know if you have. I don’t know whether Josh has received his box or not. I wanted to go over there this afternoon but the boat was over to Beaufort and I could not go. It is over a week since I seen them. they have been to Newbern this week for Burnside was presented with his elegant sword from Rhode Island and they went up to see the presentation of it. Also the 4th Regt. Rhode Island. I received those pieces cut out that you sent in the letter. They was very good. You wanted to know if you should send me some portraiture in a newspaper. You need not send any for I have got my hair cut — pineapple cut, as they call it — so I shall not need it. I should like some braid for my stripes if you can send it anyway. Oh, by the way, I had a splendid dream the other night. I thought I got home. It was a rainy day and I was welcomed home with many kisses and thought I had just sat down to eat a nice supper from grandma’s table. Ask her if she don’t wish it had been true. I do. Well, I was just commencing to eat some roast lamb or something else and I woke up. It was midnight and I could hear the music from Joe Greene’s band [Fourth Rhode Island H.A.] in Beaufort. They was giving a serenade. It did sound splendid over the water for it was very calm and still. Hope the time will soon come when these dreams will be more than dreams — will be reality. I received a letter from Aunt Mary this afternoon. I was delighted for I got a [cart-de-]visit also. It much made me think of him. I am still enjoying the best of health so you need not worry about me. I suppose before I write you again, 4th of July will be here and I shall write you what I was about. I shall endeavor to enjoy myself. I hope the war will end soon for we have encouraging news all the time. I am hoping McClellan will be victorious at Richmond for if he does, I think they will make peace then. I hope so, don’t you? War news? I have none for I read an account where there had been a battle at Transit Creek above Washington, North Carolina by some of Burnside’s troops and they routed the Rebels so you see you get the news there quicker than we do down here right amongst them. Give my love to all, both old and young. Kiss all the sisters and tell them to be good girls and also to my little darling Ruthie Elwood. Let me know when you receive my money if you get the whole of it $52. Give my love to Father. Tell him I hope he will write to me for I can read his writing well enough. I often dream of home nearly every night. I will close soon for I want to answer Aunt Marg’s [letter[ tonight and I’m afraid if I write much more I shall not have any news to write her. Remember me in your daily prayers. Hoping to see you all before long, I will bid you good night. Still remaining your affectionate son, — Corporal Benjamin F. Drown, Beaufort Harbor, North Carolina. Off Fort Macon, June 22, 1862. P. S. You need not worry about my box for I think I shall get it soon. ¹ The schooner John N. Genin was built in South Jamesport, Long Island. She weighed 194 tons and was built for the Brazos, Texas trade carrying cotton. She only drew eight feet of water when fully loaded with cotton. Captain Phillips commanded the John N. Genin when she took on a load of munitions at Governor’s Island in NY harbor in January 1862 and sailed for Fort Pickens at the entrance to Pensacola Harbor, Florida. When the ship crossed the gulf stream off the coast of Cape Hatteras, she was hit by a storm that nearly sunk her and she was forced to throw one hundred Parrott shells overboard to keep her afloat. She survived to continue in the service of the North throughout the remainder of the war. Hip, Hip, Hip. Hurrah, Hurrah. The stars and stripes forever! Glorious, Glorious news from noble General McClellan. Today has been a happy day for us all. This afternoon while engaged in the schooner’s hold taking account of cargo, I was startled by the firing of guns from the Fort [Fort Macon] and up I came out of the hold and I kept account of the number of guns fired which was 34. Then I knew that some great victory was won and then I heard the 4th Regt. Rhode Island band playing John Brown or Hang Jeff Davis to a Sour Apple Tree and then it run through my head that Richmond had fallen. And sure enough — it was so, for in a few minutes I heard that half of McClellan’s Army was in Richmond & the other half had gone to cut off the Rebel’s retreat. What glorious news. Mother, I think it looks now like [I’ll be] coming home before a great many years. What do you think? Well, here it is the 3rd of July again. Well do I recollect where I was a year ago this evening — down to the armory drilling to parade on the Fourth. I expect there will be great rejoicing at the North tonight and tomorrow over such glorious news. Expect the cannons will ever roar their gladness. I wish you could see how happy the troops were about here when they got the news. It was one vast cheer for one half hour. Well, I must close now for I want to finish tomorrow to let you know how I enjoyed 4th of July in Dixie Land. Everyone is rejoicing over such good news. Good night. I will commence again about the 4th of July and how I enjoyed myself. In the morning when I arose, some of the vessels had their flags flying and after breakfast our Capt. got out his flags and when all was ready, we hoisted them all at once. I hoisted the Stars & Stripes. After dinner — which consisted of roast lamb, chicken, and also chicken stewed — I went to Beaufort. When I got over there, I saw Josh just going up to Adjutant [James M.] Wheaton’s to fall info review. The 4th and 5th Regiments paraded together. Oh! by the way, while the regiment was drilling to my surprise I saw Capt. Turnlaw, Jr. and after shaking a hearty hand with him he asked me where Walt was and my brother so I told him and before we went to bed we all see him and had quite a talk with him. He is coming home the first vessel that sails north so you will see him and he will tell you how I seemed to be enjoying myself. Well, after parade the band goes to their quarters and in a few minutes I saw a large crowd coming up the street. And so I started to see what it was and the band had dressed up in antique and horrible style and they did look comical enough, I tell you. Tell Father Johnson (drummer) had an old Beaver hat on with a light swallow-tail coat stuffed in the back so that [it] made him look humped back, with a pair of breeches stuffed. And he made us think of old Uncle Persavel Doctor that was ___. The drum major had for a cane some old contraband’s broom that had all been worn down scrubbing the floor so much. And Walt and myself marched all round with besides most of the soldiers. And the greatest was all the colored population — both old and young — in the town was out and they seemed to be in the prime of life, even the oldest of them. Poor niggars — I don’t suppose they ever had such a good time before in their born days. I must say, mother, if I was far away from home down in Dixie, I enjoyed myself. Hope I shall have the pleasure of spending the next one at home for the news that Richmond has been taken and caught all the Secesh encourages us all. I must say again, it is glorious news. Three cheers for Genl. George B. McClellan and his noble army. Long may he prosper. Well I must close soon for I see I have wrote a long letter and if I don’t stop soon, I shan’t have anything to write to the rest I have to write to. I stopped with Josh and Walter to Beaufort last night and had a good time. I thought of going away with Capt. King but when the news came that Richmond was taken, the order was countermanded. The 4th Regiment had got all their water and provisions on board the steamer ready for some excursion, but when news came that Richmond was taken, they went back to Beaufort so both the 4th & 5th are at Beaufort. Please tell Father that I saw a young man this morn that came out with the new recruits for our regiment. He was from Warren. He said the last time he saw Father, he was up to Providence when the Warren Company came up. Tell Father I saw him. I must close. Give my love to all — both old and young. Read them this letter that they may know I enjoyed myself (in Dixie the 4th of July). Tell Grandma and Grandpa I still live in hopes — if God sees fit to spare my life — I shall have the pleasure of having a Merry Christmas at home next winter for I don’t see how the war can last now Richmond has fallen. Please direct my letters to the regiment after this for I expect to be turned over to another quartermaster as Capt. King wants to go to Newborn. Goodbye from your ever affectionate son, — Corporal Benjamin F. Drown, Co. C, 5th Regiment Rhode Island, Beaufort, N.C.
¹ Benjamin does not mention the incident, but the regimental history records that after the Declaration of Independence was read, a “secessionist woman among the spectators, jeeringly said, ‘Jeff Davis’ flag will float here in a fortnight! '” The regimental history does not record, however, the comical band parade through the streets of Beaufort. As I was writing a letter to James today, I thought I would write one to you so that I could send one to you so that I could send his in it. In the first place, I am well and getting along finely. I saw Josh and Walter today. They was well also. They are over to Beaufort as I suppose they have wrote you. They have got fine quarters and plenty of room. Walter’s mess occupy the garret. The house faces the shore where they get fresh sea breeze and have large trees in front of them — also piazzas in front up stairs and down. So Grandma you need not worry about us now for we are getting along nicely to what the Army in Richmond, although we have had a hard time while they were resting. However, when I hear what hard fights they have there, I think sometimes what we had to go through was hardly anything. But the fact is, we have all suffered I think. I actually wish I was there with them for if my rifle amongst them would help them out, I should willingly be there. The 4th Regiment left from here yesterday. I suppose they are going to Richmond for Burnside has gone with 12,000 of his troops there. Strange as it may seem, the 3rd of July we find a salute from Fort Macon for McClellan’s victory at Richmond and [on] the 5th, news came that he had to retreat and lost [a] great many men. But there has been so many stories that I have made up my mind not to believe any of them till we get the right report. I hope McClellan will be successful there. If not, I don’t know where it will end but I don’t feel discouraged. McClellan will take it [Richmond], I think, if he loses his whole army in taking it. But don’t get discouraged, Grandma. We all shall be at home before long, I hope. And Uncle Jim will get home by the first of September. And if I should get home Christmas, what a merry Christmas it would be Grandma. I don’t believe in looking on the dark side. That is all that has kept me in such good health while I have been here. And I can’t be too thankful to my Heavenly Father for watching over me through the trials and danger I have been exposed [to]. This is a splendid place — as much so as any in the southern states, I think. Splendid sea breezes. Give my love to Grandpa. Tell him I heard his garden looked finely. Wished I could be there and have a good meal of his green corn and beans when they are ripe. This afternoon I laid down and had a nap and what little I slept — about one hour and a half — I dreamt I was at home. But I got back again, I see, and took supper on the schooner. I dream of home every night. Hope it will be more than [a] dream before long. 9th Army Corps V. A.
I will now write a few more lines to you. I am encamped on top of a splendid hill some two miles from Fredericksburg and from this hill we have a splendid view of a valley below where thousands of troops are encamped and it looks splendid. I wish you could see it. You cannot imagine how pleasant it is. And in the evening it looks from the hill like one vast city. This morning I was awakened by the numerous reveilles from the camp. It was one vast roll. I have with three other clerks one tent to ourselves and I must say I am enjoying myself as well as [I] want to be (all but one thing — I don’t find the young ladies in abundance). I arrived yesterday about noon. It was very hot indeed. Troops have been coming in for three or four days night & day. I came here by the railroad that leads through to Richmond but did not go quite there. Thought it would be best to stop this side a little ways. We are now within 50 miles of Richmond and within 10 miles of Stonewall Jackson expecting every night to hear the long roll for I heard that he was at Fredericksburg within a few days dressed in disguise. There is a small paper printed here called the Christian Banner and shall send you one in a few days. How long we shall stop here I can’t tell — not more than three or four days I think. As soon as the troops get rested a little, shall make a move. It was a hard sight to see the poor fellows for it was so warm that they looked as if they were most melted. No one knows anything about what the poor soldier has to go through with. Writing cannot tell. I was down to the landing yesterday and saw Burnside riding about with his old hat with the brim turned down and his checkered gingham shirt. Anyone to see him coming would think he was some nice old farmer instead of a Major General saluting every soldier he meets (Give me Burnside yet). 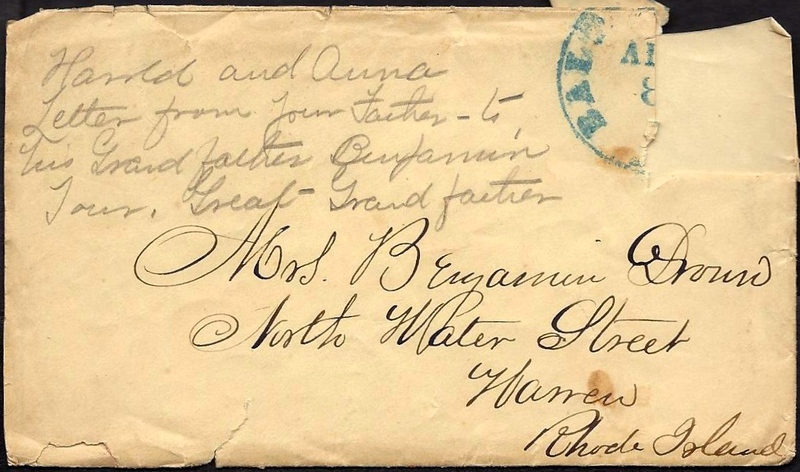 I hardly know what else to write for I am about to eat breakfast which will be codfish balls and ham, hardtack &c. &c.
In my last letter I think I told you I saw the Cumberland at Newport News just as she sank after her engagement with the Merrimac. It was a sad sight. I am now in old Virginia nearly in the centre. Little did I think two weeks ago I should be in Virginia but here I am. It looks here like northern soil a little. Good spring water. Well I must close for I have no more time now. Love to all. tell them I am well. Kiss the girls for me — especially Ruthie. It is Sabbath morning and it is cool and quite pleasant and I will write again to you. I have been looking anxiously for letters from you but have not yet received any. I think it is strange for I have wrote to Joe since I wrote your letter and got the answer from him this morning but not from you. Oh! dear mother, I hardly know what to make of this war! I don’t like to write anything discouraging but this morning I feel sad for in Joe’s letter he said — and it almost made me cry when I saw — that Father had enlisted. I am glad he is so patriotic but I think after sending two sons into the field, he might have stayed at home and let it rest at that. But however, I suppose it they intend to draft, it is a great deal better to volunteer than to be drafted. (One thing I hope) they will draft and bring out some of the cowards who is hanging back when their country needs them. It is a shame and I think those that have to be drafted ought to be made to go without any bounty and put somewhere so they could smell a little powder and show what it is. I suppose Josh & Walt will almost think they have got home as far as seeing Father is concerned. I should like to see him first rate. Well Mother, keep up good spirits for I think God will bless and protect us. He has so far and I trust he will hereafter. And pray that he will return us all to home again in safely. When you write, let me know all about things, and if you receive my picture I sent you. And mother, you can willingly take my money. I will give you all my wages so that you can get along. I expect you feel bad about Father going for you hardly know how to let Josh and myself go. And now that Father is going I know your feelings. But Mother, keep up good spirits. I feel very bad myself. I can hardly keep from crying myself. I feel more down-hearted this morning than I have through the whole war. Say nothing about what I have had to put up and go through with. But I shall still try to keep up good spirits and pray to God that he will bless us all, that we may succeed in crushing out the Rebellion. When you write, let me know when Father left and how and all about it. I have not heard from the boys since I left them — only through Joe’s letter that you had letters from them [and] that they were in New Berne. I am well and encamped where I was when I last wrote. Expect to march every day. Gen. McClellan’s troops are coming in here night and day. I expect to see the 2nd Rhode Island everyday here. Thursday last was my birthday which I spent about camp. Oh! 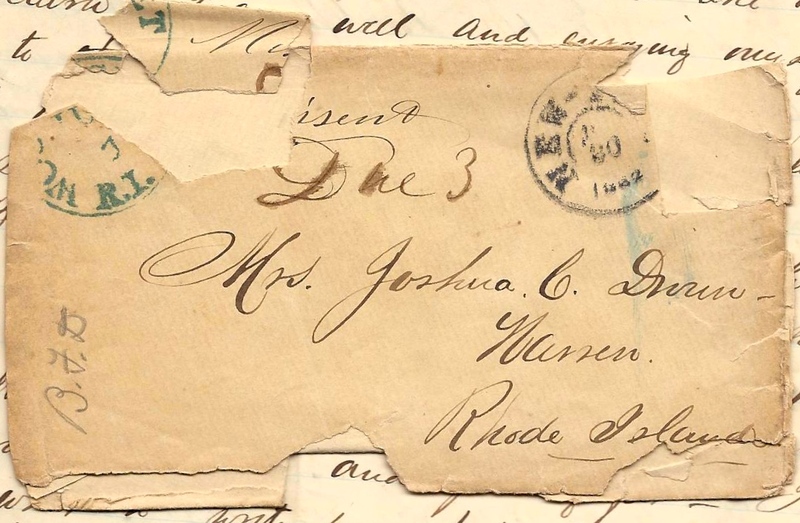 It is rather curious but I dreamt the other night that Father enlisted and went to our regiment but I did not think much about it until I received Joe’s letter this morning stating that he had enlisted. The 4th Rhode Island Band are to go home next week and I know the drummer will go. I suppose I shall see him before he goes and send some word home. He is encamped just across the road from me. Joe said that Father was going next week — perhaps you will get the letter before he goes. If you do, tell him I felt quite sad when I heard he was going but I am glad to see him so patriotic, but think he was most too patriotic for I think he had done well enough when he sent two sons in the field. Tell him to write to me so I can know how he is. What are you going to do about the chickens, pigs, and garden? I wish I was there for I suppose you have got some nice beans. Well mother, I hope we shall be there soon for when this army under Burnside moves, I do not think there will be any trifling. I will say again, mother, don’t feel sad for you have my money to keep you comfortable and with Father’s, I think you will get along. But as far as that is concerned, I don’t suppose you think so much about as the idea of having Father go. Give my love to all and tell them I am well and please write soon for I am anxious waiting to hear from you. How is Ruthie? Kiss her for me. I would like to be there this very day and see you all. Still praying to God that the time will soon come. Goodbye. From your loving son, — Benjamin F.
This entry was posted on Monday, September 22nd, 2014 at 8:23 pm	and posted in Uncategorized. You can follow any responses to this entry through the RSS 2.0 feed.